If you live in New York City – this is not really for you. You know every nook, every corner, every speakeasy and every power breakfast spot, don’t you? Well, you should. If you don’t live in New York City though, and you have 48 hours in town into which you’re packing in both business and pleasure, read on. As regular HB members will know, whilst we’re based in London, we are regularly state-side with our US family – a large slug of whom are in Manhattan. Over the years we’ve developed a great knowledge of how to do the big apple on the fly so here is a potted guide of what to hit up in 2018. Disclaimer – past performance is no indication of future returns. Bars move, restaurants close down and we’ll be damned if we can remember how to get into that speakeasy we found post-HedgeBrunch December 2016 – we’re still looking! You’re not short of options with hotels in NYC, of course, but we recently stayed at The Moxy “Times Square” and had a blast. Thankfully it’s not actually in or overlooking Times Square, that would be a bit much, it’s just a short hop down to West 36th and 7th Avenue but very much still in the beating heart of central Manhattan. The Moxy is a new breed of hotel – squarley aimed at the young and young at heart. You don’t come here to kick back and relax in peace, you don’t come for the spa and you don’t come here for your honeymoon. You come here for one reason – to be engrossed in the glorious, enlivening, exhilarating and electrifying epicentre of New-York-Goddam-City. Check it out – rooms are small but comfy and oh-so-very-cool and the hotel is packed with so much it feels the island has been condensed into one spot just for you. There’s 24/7 fun to be had here for sure, but, equally, it’s a very convenient spot if you’re bouncing around Midtown for meetings all day – the fun will be there when you’re done! When you’ve rung every ounce of fun out at The Moxy’s Magic Hour bar (above). There are three HedgeBrunch Favourites that never fail. We often hit up The Campbell Apartment for a late afternoon meeting with a family office or fund. It’s an open-secret spot, “hidden” away in the corner of Grand Central. It’s one of the original “I know a little place” type bars. Head on up the practically vertical carpeted staircase and settle in for a Manhattan (the classic cocktail). From there, as you’re evening rolls on you’re heading to the rooftops again at The Peninsula and The Viceroy hotels. 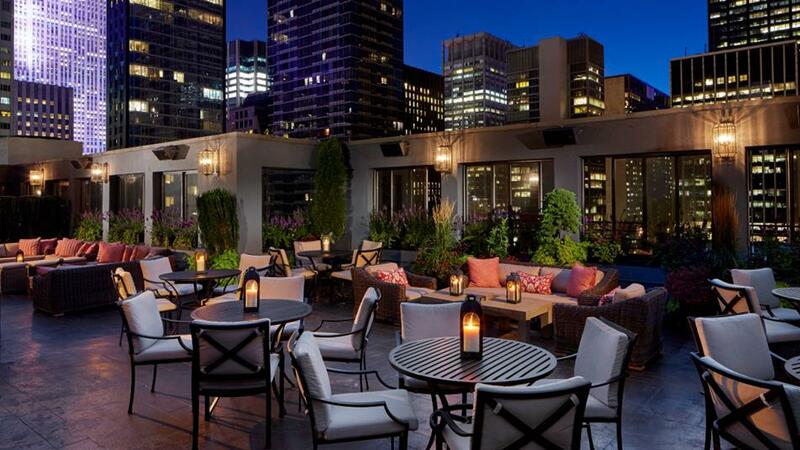 The Peninsula rooftop bar (pictured below) has been the go-to post HedgeBrunch spot since our very first US event in 2014, and it remains a firm favourite. Incredible on a summer’s eve and especially exciting on a snowy winter’s eve, you simply cannot go wrong alone or in company with a Whiskey Sour and this view. 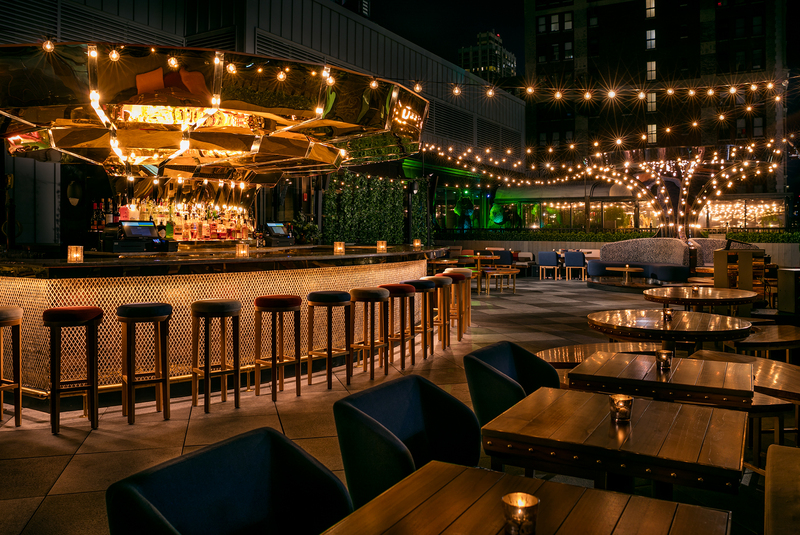 To finish off your night, make the short hop across the rooftops to The Roof at The Viceroy hotel, overlooking Central Park. Hippier than both The Campbell and The Peninsula, The Roof is for the only the sharpest minds and sharpest dressers. It could not be any cooler and you won’t regret it, trust us. Bonus spot. 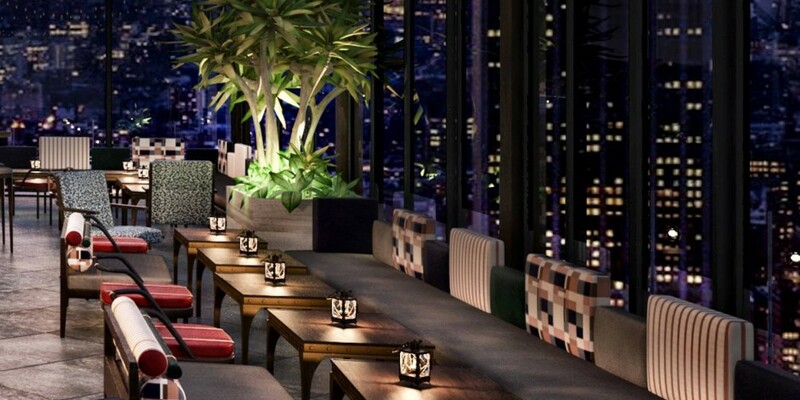 You’ll be in Midtown for our current favourite three bars above but if you find yourself downtown or around Wall St during your stay you have to hit up the new Four Seasons Hotel New York Downtown. A hotel bar again (they are often the best in NYC) this is a sharp-as-it-comes spot for perfect counter-drinking cocktails. Lean into Cut – the bar at Wolfgang Puck’s Four Seasons DT installation – and try and resists one of his world-famous steaks for your second course. Breakfast. New York does breakfast at a different level and to be honest it’s good everywhere but we have never had better avocado on toast than at 11 Howard. Order a side of bacon. It will make you cry with pleasure. A long lunch. The Waverly. We’re reticent to even tell you about this place. No photography is allowed and we’re not even going to tell you where it, it’s so precious. Look for it. Find it. Enjoy it and guard the secret. Restaurants like this are a dying breed. Your one clue – it’s South of 15th. Dinner. Manhattan no longer holds the leading spot when it comes to food and it’s definitely behind Brooklyn when it comes to the hip. 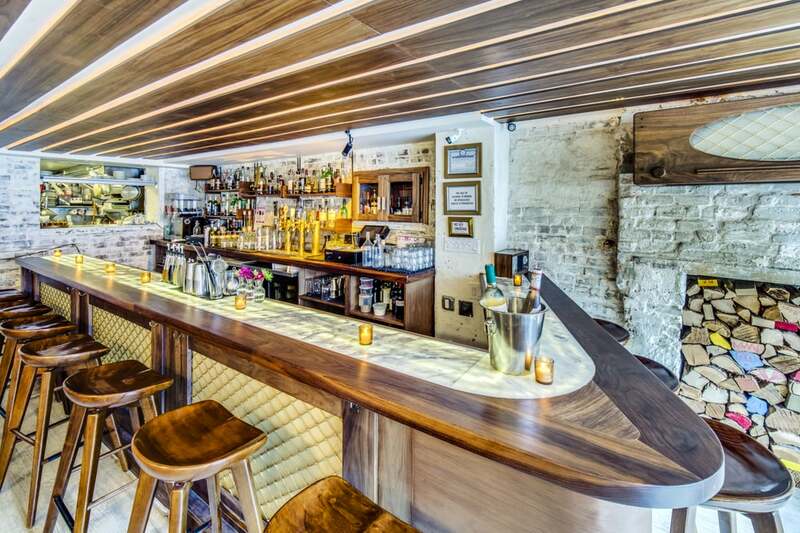 Head to Williamsburg to feel like you’ve reached the birthplace of the modern hipster movement and spend a very long evening at Loosie Rouge with friends. If you’re alone, make some friends and go. Hell, invite some friends over for the night, pay their airfares and get them around the table. It’s worth it. This place is for the foodies, the night owls, the game changers and raconteurs at the centre of the universe. Try the ceviche and the sea bass. Lunch. Waking on up the next day (stay in Brooklyn for the night at the Wythe – amazing views back over Manhattan) you’re going to want to head to Dumbo (the district down under manhattan bridge overpass, geddit) and kill your justifiable hangover at Grimaldi’s Pizza. It’s an institution and so very, very good. Be prepared to queue though. 48 hours in New York. Throw in some meetings, a trip around The Met or a game at Madison Square Gardens and you have only a few of your allotted hours left if you’ve followed the advice above. Time for home. But wait, last up – if you’re flying out of JFK – make a quick stop at BunSmith on Franklyn Avenue in Brooklyn. 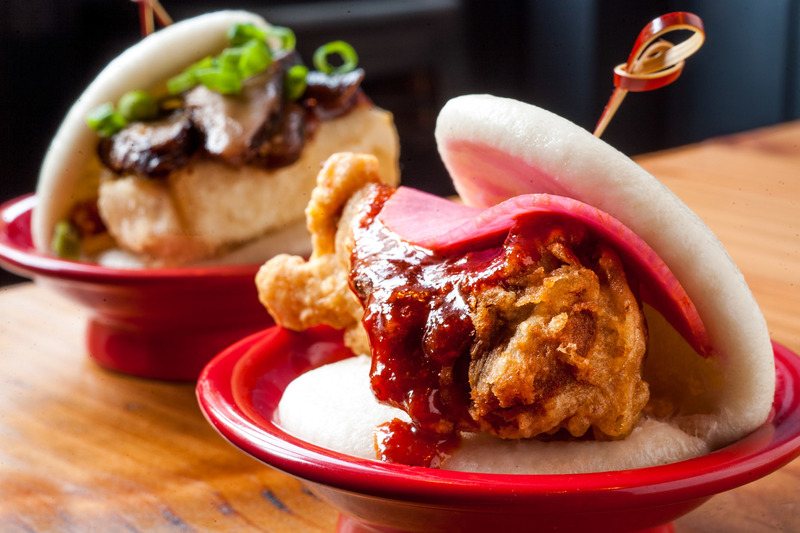 The Bao here are some of the best we’ve tasted anywhere in the world and it’s the perfect spot to say goodbye to the five boroughs. You’ll be back soon.